Originally I had planned to release the first version of briefcase tomorrow, however there are still a few critical features that are not implemented. We are very close to having a fully functional and open beta but not just yet. I will continue working hard to try to finish the functionality as soon as possible. After the first release I will also write about how you can create a test account on the development server if you want to try using it. Progress has been going well. 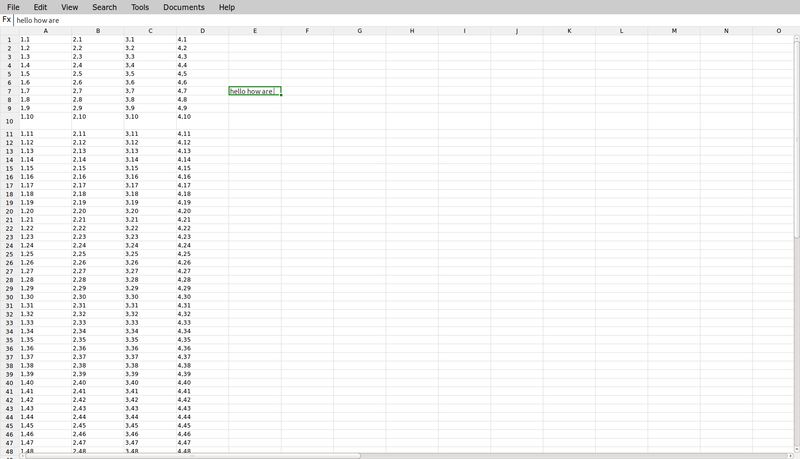 Many of the bugs that were plaguing the program have been removed and overall the spreadsheet looks nicer. The whole thing is still a bit gray but that is ok for now. Not all of the features have be re-implemented but the ones that have are done much better then last time. The spreadsheed has been tested with 5,000,000 datapoints (five million) and it was able to render at a fast enough speed to consider easily usable. the problem will be when those datapoints are all functions and twice the amount of data will need to be stored or more processor time will be used. Ill write more about it later but for now I will leave you with a screen shot! I have begin rewriting the spreadsheet interface. It is very nice to look at some of the old code and say “what the hell is this, that’s stupid” and then make it better. I can only imagine that in the next time I do it I will be looking at the code I am writing now and say the same thing. But sometimes that is just what needs to happen, throw out all the old code and start again from scratch (or almost scratch). After learning about the two statements “loose coupling and high cohesion” I find that loose coupling, making each function not rely on global variables or non argument states and splitting up functions, is much more important when you go back to try to re-factor the code. On Wednesday, the RPI Undergraduate Research Symposium. Unfortunately they only let on person actually give the oral presentation so Beth decided to not present. I believe that it went well, we used a very similar slide deck to our presentation at university of Albany. I am going to begin finishing the briefcase fronted re-factor this weekend. We gave the 4th RCOS talk last Friday, a brief update on what we were doing and what will be happening soon. The day before that we gave another talk at U-Albany’s Open source festival. It was a lot of fun giving those talks but a lot of work as well. On Wednesday we have one more talk for the Undergraduate Research Symposium (UGRS). But that is the last talk for the planned future.